I’m a firm believer in the power of business to do good. Until recently, many companies saw their role in bringing about positive change as secondary to their main goal of creating value for their shareholders. Businesses had separate corporate social responsibility departments, and separate marketing departments. Each with their own separate targets and KPIs. To truly make any change for good, to create a sustainable business legacy, this model needs to change. 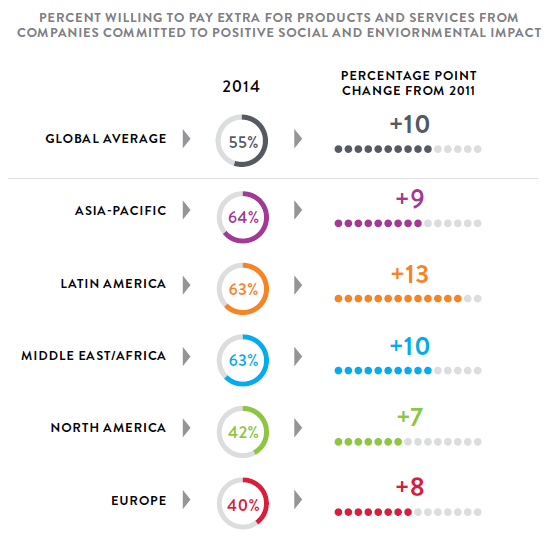 Encouragingly, the desire from consumers for businesses to make this shift is becoming ever more apparent. The popularity of socially responsible brands like Toms or Patagonia shows the increasing expectation from people that businesses should take positive actions, and more – to be role models in this space. But let me be clear: this is not just a moral argument. People often ask me what’s the business case for sustainability. My reply? I’d love to see the business case for the alternative. Show me the business case for destroying the very planet and society in which we live. Future proofing your business against a changing climate and building a more prosperous and healthy society can only be of economic benefit to a business. As a business, we are starting to see the dividends of taking this approach, although it is far from a new idea for Unilever. Rather, it goes right back to our roots, when our founder Lord Leverhulme developed Sunlight soap, with a mission to make cleanliness commonplace among the Victorian masses. Today that mission continues with us, but we are focused on making sustainable living commonplace across the globe. It’s a big ambition, and every ambition needs a plan, so six years ago we launched ours, the Unilever Sustainable Living Plan. At its heart is the principle of decoupling the growth of our business from our environmental footprint, while increasing our positive social impact. We brought the unusual bedfellows of marketing, communications, media and sustainability all under one department and gave ourselves one common goal. I firmly believe you can’t have marketing sitting in one corner shouting “sell more stuff” with a CSR department somewhere else trying to negate the “bad” your business is doing elsewhere. It has to be a whole system approach – all brands, all markets, no exceptions. Sustainability needs to be mainstreamed. And it is working. What we call our Sustainable Living Brands – which, among other criteria, must have an active brand purpose – are growing 30% faster than the rest of our business, and delivering almost half our growth. These are not niche brands. They include some of our biggest, including Dove, Omo, Knorr, Lipton and Hellmann’s. And they’re all proving that businesses can do well by doing good across three areas of importance to Unilever – health and wellbeing, reducing our environmental impact and enhancing livelihoods. 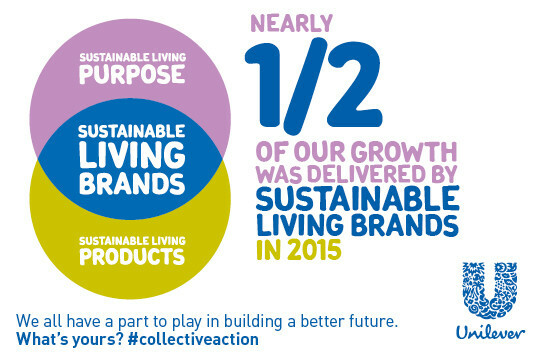 The Unilever Sustainable Living Plan is structured around these three pillars. Let me give you an example of what our brands are doing in each. Research identifies toothache as the main reason children miss school in some countries. Poor oral health is a largely preventable problem, yet it is estimated that more than 1 billion people don’t use toothpaste and more than 3 billion do not brush twice daily. This is a great example of how the economic case can line up perfectly with a public need, so our Signal toothpaste brand set a goal to reach 50 million people by 2020 with an oral health campaign encouraging children to brush night and day. We have already reached 71 million people, and are working to engage even more. And the business case? Where we have invested in these programmes in Africa, our business grew by over a quarter from 2014 to 2015. The planet and an organization pays for waste twice – once when you create it and again when you need to get rid of it. Clearly this is not a sustainable way to do business, and a large part of what we are doing under this pillar is around reducing waste. In January 2015 we achieved a significant milestone when our global factory network of over 240 factories sent zero non-hazardous waste to landfill. Through collaboration and by capitalizing on our “zero waste mindset” we have extended our ambition beyond our factories. By February 2016, nearly 400 more Unilever sites worldwide – such as warehouses, distribution centres and offices – had achieved zero non-hazardous waste to landfill. So now over 600 sites across 70 countries have found alternative routes for their waste and are proving that it’s a resource with many potential uses – from converting factory waste to building materials, to composting food waste from staff cafeterias. And it’s paying off – since 2008 our waste programme has contributed to costs avoided of around €250 million and created hundreds of jobs. Empowering women is one of the United Nations Sustainable Development Goals and Unilever is a strong advocate for gender equality. Take our Shakti project in India, which aims to financially empower rural women, help them develop entrepreneurship skills, and create livelihoods. By 2015, we trained around 70,000 women, with basic business, IT, sales, and health and hygiene skills, while also equipping them with business tools enabling them to operate more efficiently. The majority of Shakti entrepreneurs earn more than Rs 1,000 a month by distributing our brands in more than 165,000 villages, reaching over 4 million rural households. The women get training and a rewarding job, we get a dedicated and passionate set of brand ambassadors distributing our products. The Shakti model is now being adapted and spread into other markets. Some of these examples are encouraging many people to make small changes, and some of them are driving a much larger, systemic transformation. But the common theme is that with collective action, a movement is created, sustained and grown that has real impact. Of course, it’s the collaboration part that is key, and we are working with NGOs, governments, our supply chain, smallholder farmers and more to drive real transformational change. Engaging young people in this journey is absolutely key, and one great community doing this is Collectively. The platform brings together young entrepreneurs, big established brands, the World Economic Forum, NGOs and individuals to share ideas and innovations and motivate people to see the difference they can make. There has never been a better time to build a bright future for the generations to come, but we all need to pull together to make this happen.